There are a slew of changes on buying and selling properties announced in this 3 short months of 2017. The way we should look at these policies is that the government have a few levers that they can pull and push to stimulate on the demand side or the supply side. There are various niche market segments as well. In Singapore Budget 2017, Mr Heng announced that for first time buyers the housing grants granted will be bumped up by $10,000. This looks to me like a small change. This means that for prospective resale flat buyers, they will look to enjoy grants from $75,000 to $110,000 for 4 room flats or smaller and $65,000 to $100,000 for 5 room flats. If you form your family early you might take advantage of the Additional housing grant of $5,000 to $40,000 but for those who wait for their salary to stabilize it is likely this will not matter much. So all in all, it seems there is a slight $10,000 bump. This to me looks like more of a demand lever. In my opinion, there are a slew of Executive Condo released in the past 3 years and they reached TOP soon. The home owners would need to sell off their current homes first. First time buyers are looking more towards securing BTO flats. I am not sure how much this lever helps, but it brings to attention that resale flats, with the grants look a more viable option for first time buyers. On 10 March 2017, the government announced some relaxation of the seller’s stamp duty. The seller’s stamp duty is a tax if you sell the property within the first 4 years. The tax was 4% to 16%. Refer to the table above. With this change, the stamp duty levied will be enforced for the first 3 years instead of 4 and at each band, they are 4% lesser. The seller’s stamp duty is a tax which I always feel is a good one. It discourages speculation, and excessive property flipping. This is some what similar to capital gains tax levied in other countries when they sell their property. Lowering this looks to me as more of a supply side lever. It does less to the demand of properties in the country. Some may argue that lowering this, makes foreign buyers more willing to purchase Singapore properties as the selling conditions are “less tough”, but the Singapore government can always reverse this just as fast and they are caught out. If foreign buyers need to flip, they need to pay both additional buyer’s stamp duty and seller stamp duty within 3 years. They could do that but it is hefty! Reducing the seller’s stamp duty quantum looks to me as making it less painful for the property owners pondering about selling. The seller stamp duty prohibits them from selling as it is additional losses. For example, if selling now results in a 5% loss on their purchase, an additional of 12% seller stamp duty would result in a 17% loss if they want to sell off in 2 years. Reducing by 1 year odes not seem very significant, but it does coincide with those who bought at 2013 peak. This could really help them. I realize I made a mistake that this reduction in seller stamp duty affects current housing. I was wrong. This only applies from 11 March 2017 onwards. With this new realization, it seems not so much of a supply side lever but more demand side. Investors will be less apprehensive to purchase the private properties due to a smaller lock in. The TDSR, or Total Debt Servicing Ratio, is one of the most prudent rules. It should have been put in place long ago. Under this framework, property loans extended by a bank cannot exceed a TDSR threshold of 60 per cent. The TDSR factors in your total loans from housing, vehicle loan, credit card loan and personal loan. On the cash inflow side, you can pledge certain liquid assets, non liquid assets that goes towards your final income computation. This is to ensure that only those who have the financial leeway could purchase. In Sep 2016, MAS announced a tweak to the TDSR. When it comes to refinancing mortgage, those that bought their properties before the TDSR announcement are exempted from using TDSR when computing the amount they could refinance, and the corresponding mortgage payment. With the Sep 2016 tweak, all loans that take place AFTER the TDSR rule was announced need not go through this TDSR computation. Basically, it is an indication that many that bought before the TDSR are on very popular floating interest rate mortgages. The first 3 years tend to be extremely low and attractive rates. After that, the rates are much higher, and this affects their cash flow. With the TDSR, these property owners, who have bought 2 properties, or through those loophole bought 1 condo each, failed their TDSR check and couldn’t refinance and have to lived with higher interest rates. In the same Mar 2017 announcement, there are further concessions on TDSR. This 60 per cent TDSR threshold will no longer apply to mortgage equity withdrawal loans with loan-to-value ratios of 50 per cent and below. The objective of this change, to me is not demand based or supply based. It is to help fully or nearly fully paid property owners monetize their home. I spoke to an experienced property agent prior to this and he shared some case study on the ground. He has clients that have landed property, but because their income is lower or no income due to their retiree status, they found it tough to monetize their home. They cannot refinance their property, to “take back out” cash for retirement purpose. This < 50% LTV tweak would allow these folks to re-mortgage to back out cash. What could they do with the cash? Many think it is so that they could buy another property. They could, but that would subject them to another loan and that loan will be serviced by the rental income. In Singapore it is difficult to have positive cash flow yield. So this means they won’t get any income this way. They could use the cash to put in some annuity to provide another stream of cash flow. Some adventurous ones might form a stock investment portfolio that leans towards income based. I can’t speak for others but I was surprised that the property stocks was moving. I believe they take it that more relaxing measures are coming, and are pricing in future growth now (which means they might be poor purchase in the future). There are some that say, relative to Hong Kong and other countries, it would make foreign buyers look at Singapore private property in a much attractive manner. I don’t think so. I think the changes are not large enough to make a difference. Prior to this, Hong Kong have looked more expensive and in reality there is no need to perform this, should the purpose be to do that. I take it that somehow, our love for property is having some really challenging indigestion. And the government sees this. To me, if you want to buy and own property, you better have a strategy how to monetize, or cash flow your property. I asked many property owners this, and I get really poor answers that I realize this is not part of their plan at all. Most people buy a home to stay. Monthly salary as income. So the 50% LTV helps provide quality of life. This is major change imo as sg greying population get larger and i agreed to the direction. Additional home will subject to TDSR and ABSD so i think is much less benefits. I think the TDSR is applicable for purchases after March 11, 2017. If so, it should not affect those that bought earlier, i.e 2013? hi G , you are right. I made a mistake there. 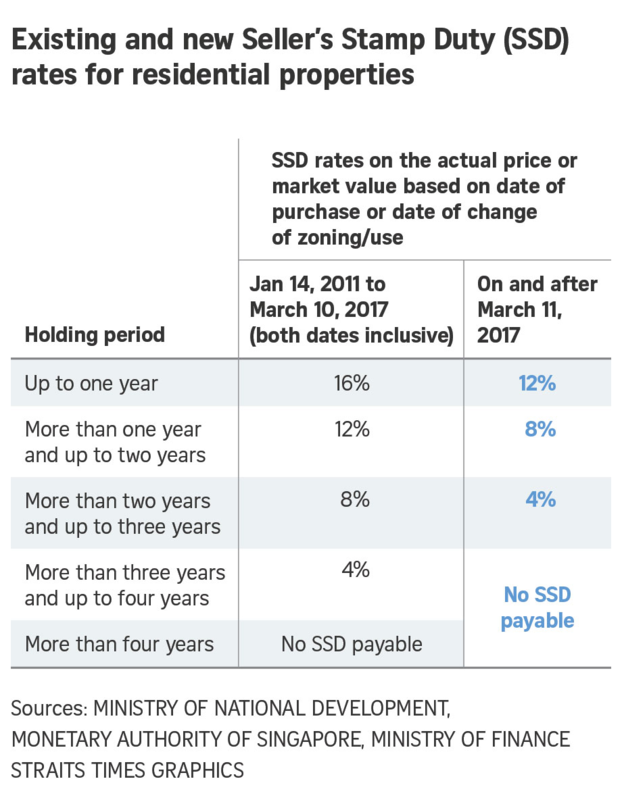 From I understand, the change in SSD is not retrospective, meaning it only applies to transactions from 11 March 2017. This should not have any effect on people who bought in the past four years right? There are lots of speculative traders in the stock market. Fundamentals have not changed in the property market in Singapore, so why should property stocks rise? There is no change to cashflows, nett assest values, or dividend payouts… its pure speculation.